Out of all the holiday flavors, gingerbread is by far my favorite. Mint chocolate is great but it's place in my heart will always be second to the bright, vibrant, and unique flavor of gingerbread. In case you missed it, I made Gingerbread Cake Donuts with Cream Cheese Frosting to begin my seasonal love affair with this delicious holiday staple. If mint chocolate is your number one, though, I have a Spiked Mint Hot Cocoa that pairs perfectly with a crackling fire and movie (and one of the donuts, too). When it came to Santa's cookie's as a kid, I always wanted to make him gingersnaps. I thought, "Santa can have chocolate chip all year round, but gingersnaps are a special Christmas treat". Now that I'm older, I say screw the rules and make gingersnaps whenever I damn please and making the most perfectly chewy, moist gingersnaps has been my life's quest this holiday season. Veganizing baked goods has never been easier, especially in 2017. Vegans are finding more and more ways to imitate eggs, milk, and butter so we can all enjoy the delicious goodies of the baking world. Using your favorite vegan butter and a flax egg, combined with deliciously gooey blackstrap molasses it's melt in your mouth good. I love these cookies because they're chewy but have a crispy outer edge with the perfect amount of crunch. 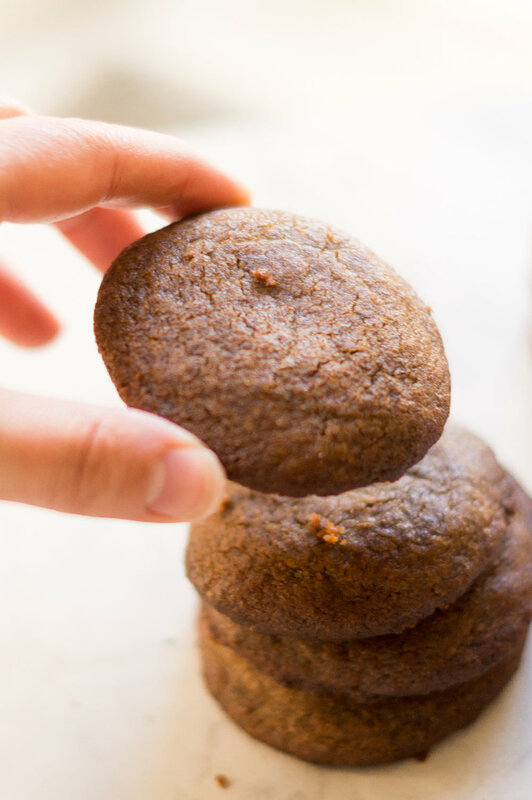 Gingerbread snaps are the most unique of all cookies (maybe I'm being dramatic) because they're tangy, vibrant and a little savory, but they're also not too sweet. When you're looking at the recipe you may notice there isn't any baking powder or soda, which are ingredients that help make dough and batter rise in baking. However, in order to ensure the cookies stay extra moist and chewy I left those ingredients out because the dough will retain the moisture. If you want something a bit crunchier and sweeter I recommend trying my Candied Holiday Walnuts. They make a great alternative to popcorn during those Christmas movie marathons and are especially delicious if you eat them when they're warm. Preheat your oven to 350 degrees Fahrenheit. Line a baking sheet with parchment paper. Prepare your flax egg (1 tbsp flax meal, 3 tbsp cold water). Whip the butter with the brown sugar until fully combined. Slowly add about 1.5 cups flour folding it into the dough using a spatula. After the first 1.5 cups of flour, add the flax egg and molasses, again folding it into the dough with the spatula. Once those two ingredients are well combined, add the rest of the flour, salt, ground ginger, cinnamon, and cloves folding it all together one last time. Using either a scooper or portioning with your hands, roll about a pingpong ball sized amount of dough and place six rounds on each sheet. Cook each batch for 10 minutes and allow to cool for 5 minutes after removing from the oven. Enjoy immediately or save in a sealable container to keep fresh, preferably the refrigerator.